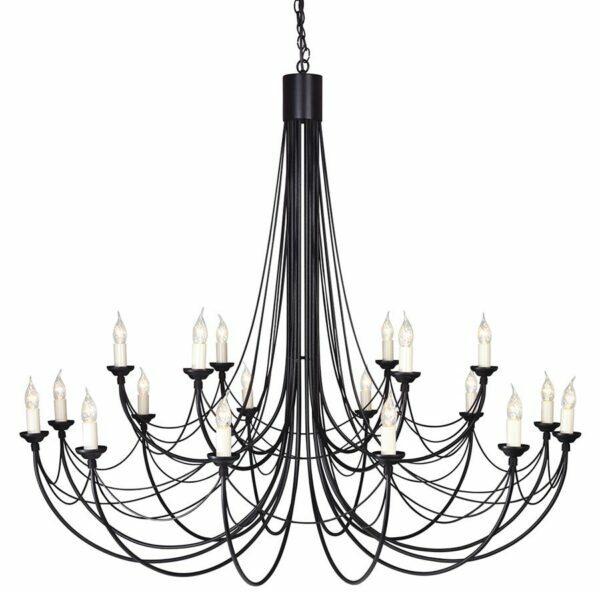 This Elstead Carisbrooke 18 light massive chandelier in Gothic black ironwork is made in Britain and features a circular ceiling mount, with ornate petal shield and chain link suspension. The very large tiered frame boasts eighteen curved candelabra arms braced with hand bound wire-work drapes and fitted with candle style lights, metal candle pans and ivory candle tubes. The Carisbrooke collection is inspired by wrought iron Gothic style lights from bygone days. 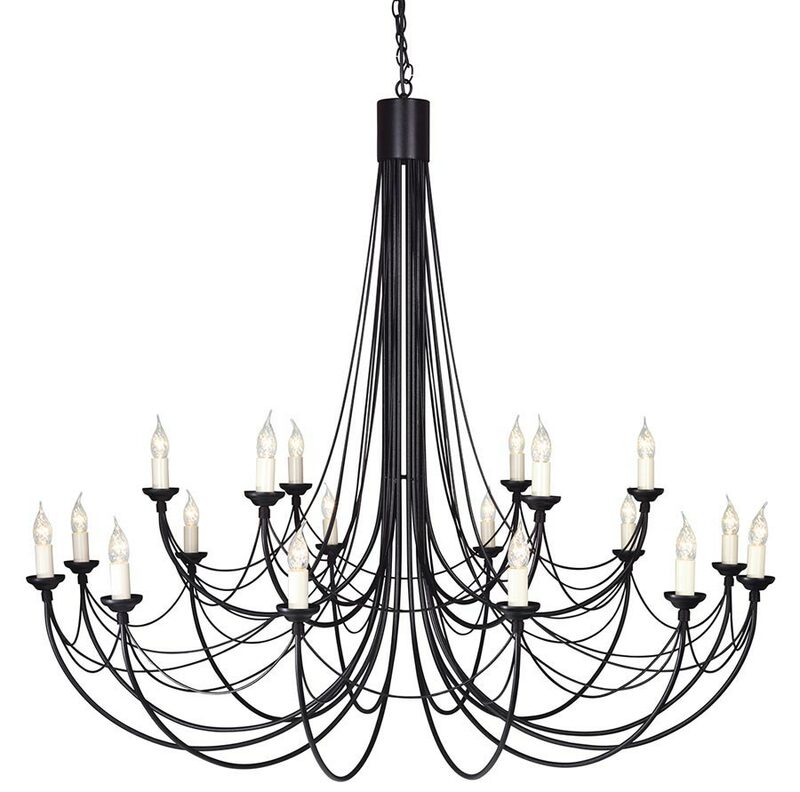 This huge candelabra chandelier is hand crafted in Elstead Lightings UK factory and finished in black. There are optional glass shades available should you wish to personalise any fitting in the range. Please note that if shades are used the maximum wattage per lamp is reduced to 40w. The classic black finish and wrought iron candelabra style combine to create a large eye-catching focal point that is ideal for any traditional or period setting. Ideal ironwork lighting for a very large hallway, double height space, over a stairwell, dining room, or living room with sufficient ceiling height. Please note: This is a very large ceiling light that has a diameter of 142cm and minimum drop of 137cm that will require a very large space to be shown at its best. Please ensure that this fitting is suitable prior to ordering. supplied with 300cm of height adjustable chain suspension that can be shortened at the time of fitting by removing links to achieve the desired drop; please see the technical information below for dimensions. There are matching fittings available in the Carisbrooke collection that can be viewed below. This classic light is supplied by Elstead Lighting, a British company that specialise in the manufacture and distribution of quality decorative lighting such as the Carisbrooke 18 light massive chandelier in Gothic black ironwork and made in Britain you see here.